This past weekend my friend and I were hungry and trying to think of a place to have dinner at. We wanted a place that had some good-quality food, affordable prices, and something almost home-cooked. We are some picky eaters, but after some thinking I finally thought of a spot we could eat at: Cuenelli’s Peruvian Style Rotisserie Chicken. A small restaurant located next to Green Iguana in Riverview in the Winthrop Plaza, Cuenelli’s has been around for some time now but is still unknown to many Tampa Bay residents. 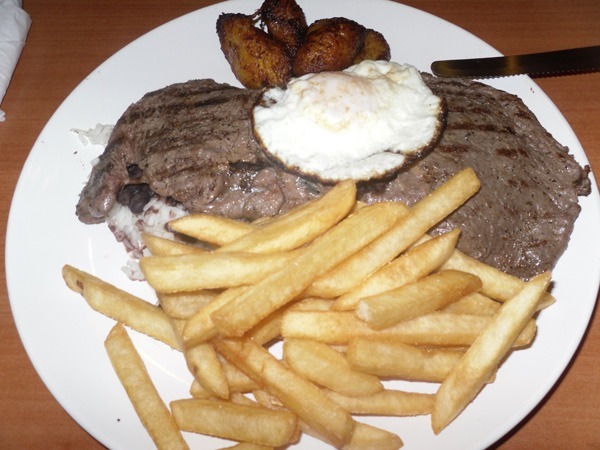 Offering many Peruvian specialties at affordable prices (usually under $10) on their menu, such as Papa la Huancaina (a Peruvian salad of boiled yellow potatoes in a spicy cream sauce), Lomo Saltado (grilled sirloin with onions and tomatoes, served with rice and french fries), and Bisteck a lo Pobre (Palomilla steak served with rice, beans, fried egg, french fries, and plaintains). They also have several desserts, such as Flan, Tres Leches, Churros, and various specialties during the weekend. When my friend and I arrived we were able to choose where we wanted to sit. The server was patient as I explained the menu to my friend and we ordered Inca Cola (a lemon verbana-flavored soda) to drink. Another popular drink at Cuenelli’s and many Peruvian restaurants is Chicha (a purple corn soft drink which people rave about it though I have never personally tried it). My friend finally decided to order their Bisteck a lo Pobre ($10.95) and I ordered their Chicken Sandwich ($6.99). The wait time was pretty short for our meals. My friend’s Bisteck a lo Pobre looked so good that I had to make sure I showed my readers. The palomilla steak is pretty big as you can see. He had a hard time eating it by himself and there have been plenty of times when I have ordered this and not been able to finish my food. My friend ate his food one thing at a time, but I believe that the best way to eat this entree is to break the yolk and mix everything together. There have been days when I was feeling sick and this meal made me feel way better and energized. My Chicken Sandwich was fantastic. The chicken was tender and easy to chew, it just melted in my mouth. The lettuce, tomatoes, and onions inside added even more flavor to a well seasoned chicken. I added a little extra mayonnaise to make it a little more moist. 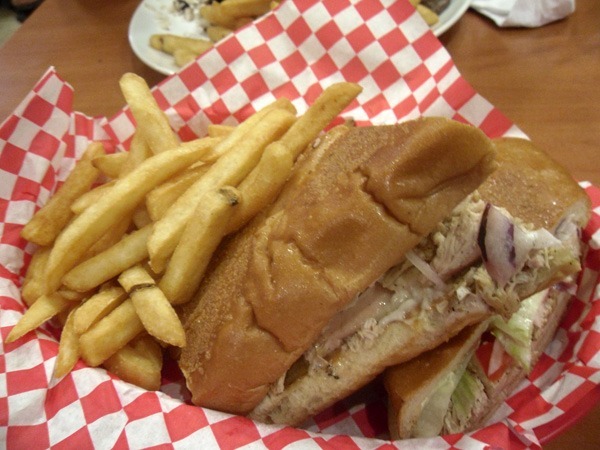 Although this photograph may make it seem like the sandwich was small, it was loaded with chicken and I actually was only able to finish half of this sandwich despite how hungry I was. The french fries taste homemade (without too much salt and a nice soft interior) and are an excellent complement to many of the choices at Cuenelli’s. Service was great and the waiter made sure to constantly check on our drinks and to ask us how our meal was. My friend was really impressed with the food and will be coming back soon. I know I will.